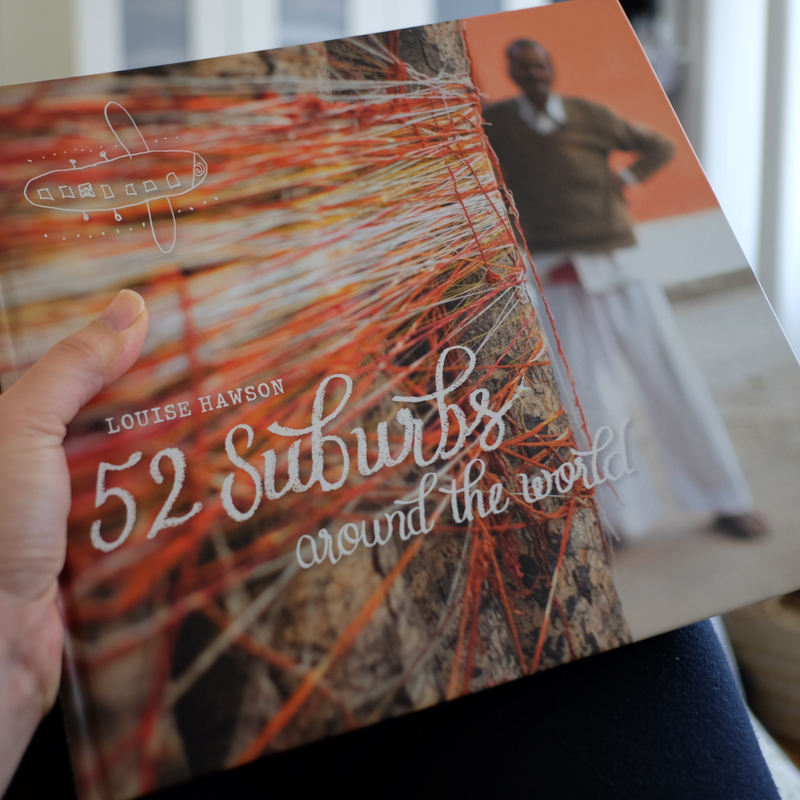 Louise Hawson’s book “52 Suburbs around the world” is an inspiring book that documents the journey of Hawson and her then eight-year-old daughter (! ), CoCo, around the world. Even though the images and words originally appeared on Hawson’s blog as she travelled, and can be still viewed there, the experience of the same images and words in the large hard-covered book was better than I expected. Hawson has taken great care to ensure the quality of the printing (read about it here) and it really shows. The photos and text are thoughtfully arranged and Hawson has remained with the style that originally appeared on the blog of diptychs with brief phrases to match those images as well as a brief report on each suburb visited. The format of those reports includes her conclusions on the suburb, “The Wrap,” and personal happenings, “On The Home Front.” A portrait of her daughter appears as a farewell to each city they visited, as well as some notes on the city by CoCo. Those farewell touches were especially endearing. I found the writing very easy to read and relate to. The honesty about not only Hawson’s opinions of her destinations, but also what was happening to her and her daughter personally, gave the book a tenderness and realism that was very engaging. Sometimes when I hear people, especially in real life, talking about their travels and international experiences it sounds as if they are listing off a collection of stamps, rather than truly speaking about their experience. Much like young children collecting sets of football cards and competing with each other in the playground. This book was the opposite of that. Hawson set out in her year-long journey not to collect photographs and bragging rights to show off to her friends, instead she set out to explore and reveal how most city dwellers of the world live, in the suburbs. Many people travel in search of the ‘authentic experience,’ describing such a thing like a badge of honour. However it is rarely followed by stories of how that traveller engaged with the local environment and culture. Hawson shows everyone how it’s done. Her images are so rich and her words are heartfelt and honest. It was impressive how she managed to capture the humanity of all the places she visited. The cultural differences and similarities are presented thoughtfully and without arrogance. I thoroughly enjoyed the book and would recommend it to anyone who often gets possessed by wanderlust, especially those with an interest in street and travel photography. The book is available at 52suburbs.com. I think it was you who recommended that blog to me in the first place (or was it??). Nice to have a followup review of the book. Gosh, the publishing process sounds tedious for the perfectionist!